I was looking for a large outdoor fountain that provided a waterfall sound rather than a trickling as many fountains seem to. 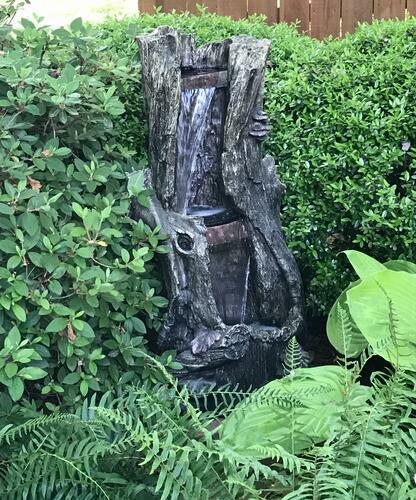 I shopped around extensively before purchasing this fountain and at just under $300, this was half the price of any other comparable fountains that I cam across. A great buy. This fountain arrived quickly and was packaged very well to protect it from damage. Itï¿½s made from fiberglass and has a great deal of fine detail and natural looking finishes. Itï¿½s overall shades of gray with LED mini lights for a subtle look at night. The fountain pump is very strong and adjustable if you donï¿½t want a fast flow. It sounds just like a true waterfall, not a weak trickle, if thatï¿½s what you want. I like how there is a narrow upright water reservoir - which minimizes a lot of the leaves and debris that normally fall into a large more exposed water pool. The height is perfect for our garden area. You will need a two outlet extension cord as there is a plug for the lights and a separate plug for the pump. Very easy to set up, but you will need an outdoor rated extension cord. Fortunately got it at a great sale ($144) so it was a wonderful value for the quality. It is fairly heavy - about 30 pounds, so perhaps two people will need to carry it, or one strong person. Love it!! Very happy with this product! String pump, looks durable outdoors, and nice heavy waterfall sound. Great value.